The First Roundtable on Holistic Design at CCHRC in Fairbanks, October 2014. 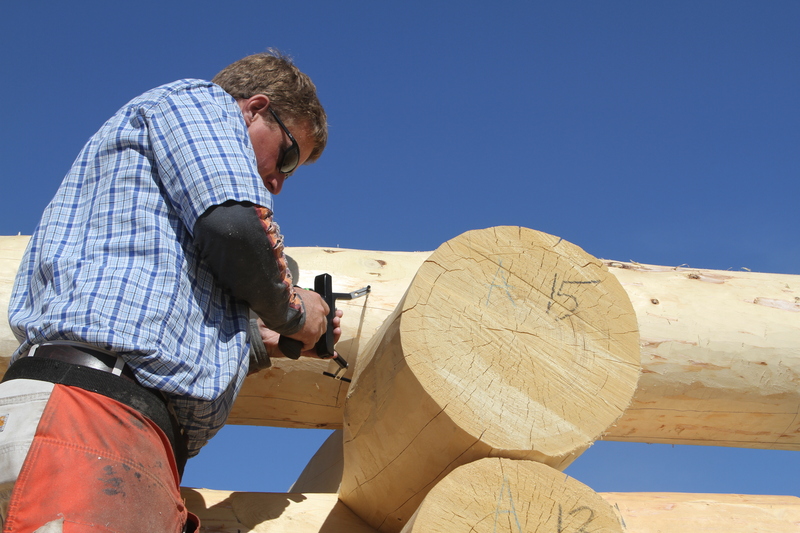 Tens of millions of dollars are spent each year on housing and infrastructure to improve quality of life in rural Alaska – wind turbines, power houses, roads, housing, weatherization, plumbing, and much more. 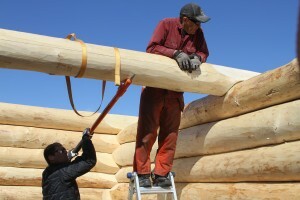 Meanwhile, many Alaska communities are struggling to survive in the face of energy costs, climate change, coastal erosion, lack of jobs, and other challenges. Plenty of organizations are trying to help – state and federal agencies, regional corporations, housing authorities, tribal entities, nonprofits – each focused on an individual aspect: energy, housing, sanitation, transportation, health, local economies, culture, education. Yet rarely do we address all these pieces in a holistic approach. The evidence is everywhere: brand new $70,000 sewer lines hooked up to rotting houses; leaky homes in villages that pay $8 a gallon for heating fuel; roads built one year and dug up the next to install water pipe. 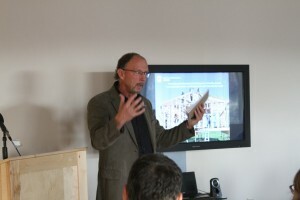 Jack Hebert with CCHRC talks about the role of energy efficient housing and indoor air quality in community development. 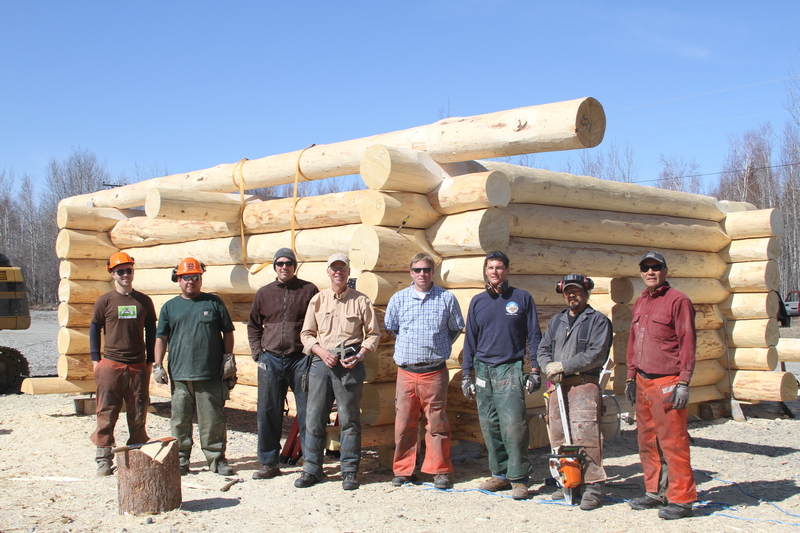 The Holistic Approach to Sustainable Northern Communities is a demonstration project that will factor in the many elements of community development. It started with two roundtable discussions this fall, where leaders from all levels of government and community planning came together and shared their successes and challenges, their needs and ideas for a more effective process. Now we are planning a pilot project in the Yukon Kuskokwim region that starts with one piece and builds a model of collaboration for all communities in Alaska. Stay tuned for our next roundtable in Anchorage in December! Posted in Uncategorized and tagged alaska, cold climate housing research center, energy efficiency, fairbanks, holistic approach, Sustainability on November 13, 2014 by mrettig. CCHRC is pleased to announce that it is creating a list of preferred energy auditors to perform audits as part of the Fairbanks Nonprofit Retrofit Pilot project. Qualifying energy auditors in Alaska are invited to apply at www.cchrc.org/fnrp. The pilot project connects the nonprofit community with financing to enable energy efficiency retrofits. CCHRC will evaluate the process and outcomes of this model to better understand several factors: the extent to which financing can replace grant funding for energy efficiency audits, the extent to which program delivery is enhanced through reduced energy costs, and the extent to which partnerships with the nonprofit sector are necessary to advance energy efficiency retrofits from audit through construction. Posted in Uncategorized on April 23, 2014 by mrettig. 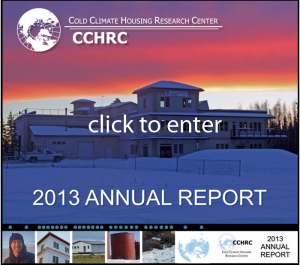 CCHRC’s 2013 annual report is now available. Check out the digital version here or download the print version at http://cchrc.org/docs/reports/2013CCHRCAnnualReport.pdf. Posted in Uncategorized on March 14, 2014 by mrettig. The Southeast Alaska Conservation Council seeks a motivated and passionate individual to work on rural energy issues. The Energy Coordinator position is responsible for assisting rural Southeast communities in identifying ways to alleviate high energy costs and reduce their dependency on fossil fuels. The position involves working very closely with local, regional and state partners in developing effective strategies to increase local engagement, provide energy educational opportunities and explore efficiency measures and renewable energy alternatives for heating, electricity and transportation. Work within a broader partnership on efforts and demonstration projects that integrate multiple components of community sustainability including affordable energy, economic development, the environment, social well being and cultural values. We are seeking a person who is highly motivated, a quick learner and able to work independently with excellent time management and communication skills. 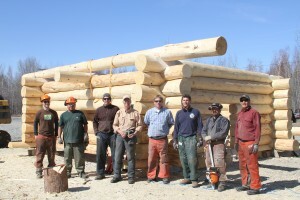 Experience working in rural Alaska communities is preferred. Familiarity with the regional energy framework of Southeast Alaska, as well as knowledge about energy efficiency and/or small scale renewable energy applications is highly desired. The Energy Coordinator position will serve as a “technical team” member providing guidance and support to staff living in rural communities, and helping to coordinate efforts and share information among communities. To apply: Email cover letter, resume, writing sample, and references to Todd Bailey at todd@seacc.org. Please put “Energy Coordinator” in the title. Posted in Uncategorized on March 7, 2014 by mrettig. The Cold Climate Housing Research Center is initiating a pilot project this month to help Alaska nonprofits save money by making their buildings more energy efficient. The application process is now open at http://cchrc.org/fnrp. 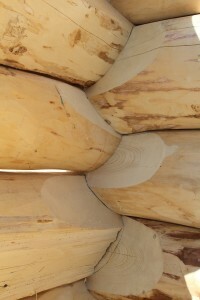 The Fairbanks Nonprofit Retrofit Pilot provides energy audits and low-interest loans to nonprofit organizations and tribal building owners as well as guidance through the entire energy retrofit process including arranging an energy audit, helping to prioritize energy improvements, helping to arrange financing, and coordinating contractors to complete the retrofit. In recent years, thousands of homeowners, small businesses and public buildings have taken advantage of energy efficiency programs to reduce operating costs. Homeowners have cut fuel use by an average 33% annually through AHFC’s Home Energy Rebate Program. The goal of the retrofit program is to help the nonprofit sector substantially reduce its energy costs so that organizations can spend more on their mission and explore the cost-savings of retrofitting at a community-scale. The pilot is made possible by $250,000 from the Denali Commission for technical assistance and energy audits. Financing will be provided by Rural Community Assistance Corporation, a nonprofit development organization serving communities in the western United States, under a $2.5 million loan from the Rasmuson Foundation. If successful, the pilot project may pave the way for a statewide private financing model for small to medium sized energy efficiency projects. For more info, contact Danny Powers at CCHRC at 907-378.3623 or danny@cchrc.org. Posted in Uncategorized on March 4, 2014 by mrettig. 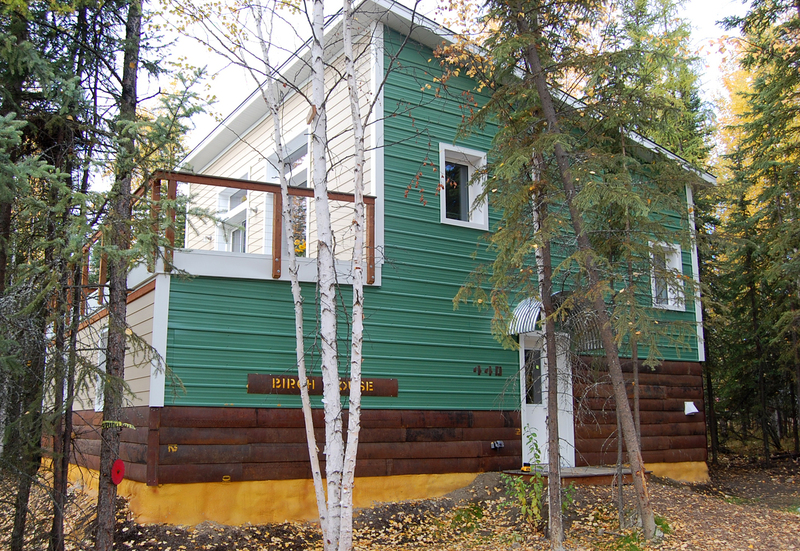 The Birch House at the UAF Sustainable Village used the equivalent of 367 gallons of heating oil in the first year of occupancy, less than half as much as an average home its size in Fairbanks. 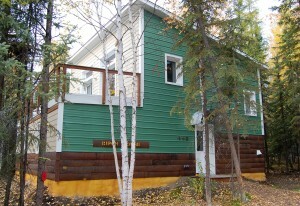 The Sustainable Village homes at the University of Alaska Fairbanks are a new model of energy efficient, affordable housing for Interior Alaska. The four 1,600-square-foot homes were built at the university in 2012 to demonstrate that super-efficient, climate-appropriate houses could be built without breaking the bank. University students helped design and build the homes, adding their own ideas about sustainable campus living. 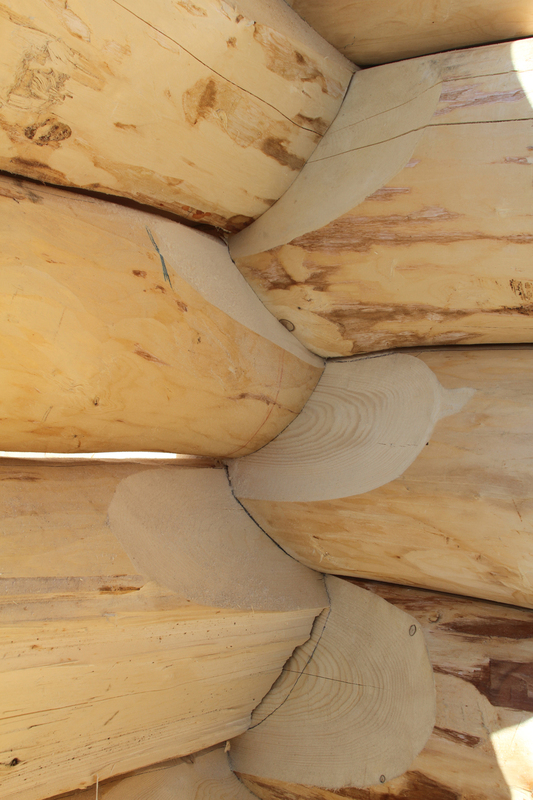 The homes incorporate experimental techniques, like solar hydronic heating and adjustable foundations on permafrost, that should reduce energy costs and improve the durability of the homes. CCHRC, along with student residents, have been monitoring the energy use and indoor air quality at the homes for the past year. On average, the homes used less than half as much energy as an average new house in Fairbanks. The lowest user was the Willow house, going through the equivalent of 366 gallons of heating oil No. 1, or 48.3 million Btu, for both heating and domestic hot water from September 2012 to September 2013. The average same-size house in Fairbanks uses about 920 gallons, according to the Alaska Housing Finance Corporation’s database. Even the average new energy efficient house uses about 660 gallons per year. That’s more than the biggest energy user at the Village, the Spruce House, which used only 463 gallons of oil equivalent. How do the homes save energy? The homes are super-insulated and incorporate energy-saving features like heat recovery ventilation, triple pane windows and Energy Star appliances. The Willow House has a REMOTE wall with 8 inches of exterior foam insulation and 3.5 inches of fiberglass batts inside the wall cavity (for a total of R-51). That’s more than twice the insulation value of a conventional 2×6 wall with 5.5 inches of fiberglass insulation. Space heating and hot water are provided by a propane boiler and three solar thermal collectors. The Spruce House, on the other hand, has a double wall filled with 18 inches of cellulose insulation (R-64), and a forced air heating system with a small diesel heater that heats fresh ventilation air. Because each house has roughly the same heating load, the difference in energy use can be largely explained by the differing mechanical systems and the occupants themselves. What’s the set point of the thermostat? How long are the showers in use? A cost analysis showed the Sustainable Village homes were competitive with other energy efficient building in the Interior — averaging about $185 per square foot, including water and wastewater, electrical, and roads (not including land). CCHRC also monitored soil temperatures at the homes to study the effects of different foundations on the ground. The two western homes are built on permafrost, or permanently frozen ground, only 2-3 feet deep in the summer. The trick when building on permafrost is to isolate the house from the ground, so heat doesn’t leak into the soil and thaw the frozen ground (which can cause expensive structural problems). These homes used experimental foam raft foundations, steel floor joists with a thick layer of polyurethane spray foam designed to protect the permafrost. Sensors underneath the house show that the foundations are working so far: the temperature at 4 feet deep has risen less than 5 degrees, and at 24 feet has remained the same. See the full report on first year performance of the homes here. Posted in Uncategorized and tagged alaska, CCHRC, cold climate housing research center, energy efficiency, energy efficient housing, fairbanks, Green Building, Sustainability, Sustainable Village, UAF Sustainable Village, University of Alaska Fairbanks on November 20, 2013 by mrettig. The hilly areas containing fractured schist and rock around Fairbanks are known for having high concentrations of radon. A good radon mitigation system will ensure healthy indoor air quality. Your single best chance at dealing with radon issues is during new construction. In this video, Ilya Benesch, building educator at the Cold Climate Housing Research Center, demonstrates the essential steps of installing a radon mitigation system for a slab-on-grade foundation. In this video, Ilya Benesch visits a construction site and explores how the contractor has installed a radon mitigation system. 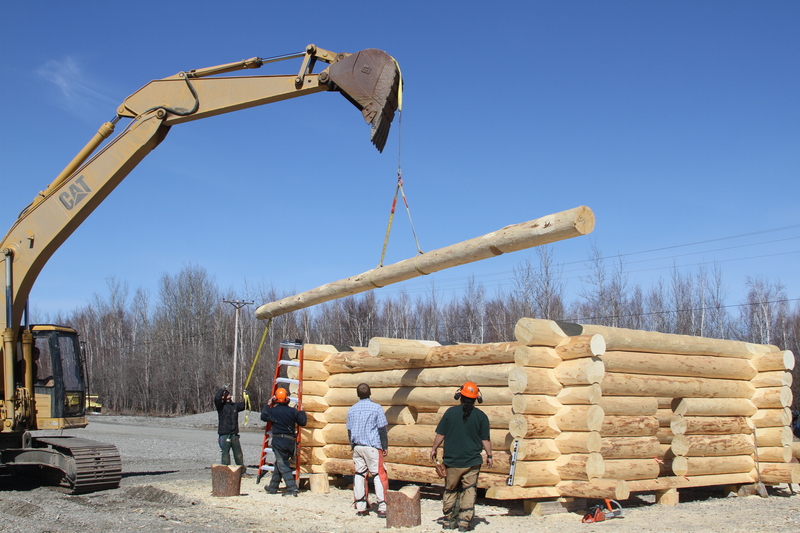 The project was funded by the University of Alaska Fairbanks Cooperative Extension Service. For more information about radon, visit: www.uaf.edu/ces/energy/radon. Posted in Uncategorized and tagged alaska, building, CCHRC, cold climate, cold climate housing research center, energy efficiency, fairbanks, new construction, radon, radon fan, radon mitigation on August 21, 2013 by mrettig. See a sneak preview of CCHRC’s Air Source Heat Pump presentation to be given at the Rural Energy Conference in Anchorage in May. Building Science Research Director Colin Craven outlines some of the opportunities and hurdles for air source heat pumps in Alaska. Posted in Uncategorized on April 26, 2013 by mrettig. Schematic of the BrHEAThe system being used in the Buckland prototype house. A new prototype system developed by CCHRC locks together heating and ventilation—two crucial elements of life in Alaska. 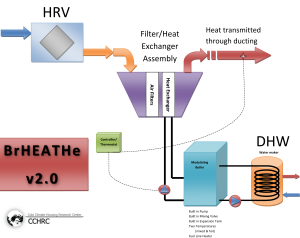 CCHRC researchers developed the integrated heating and ventilation system, called BrHEAThe, to ensure that new energy efficient homes are getting ample fresh air. 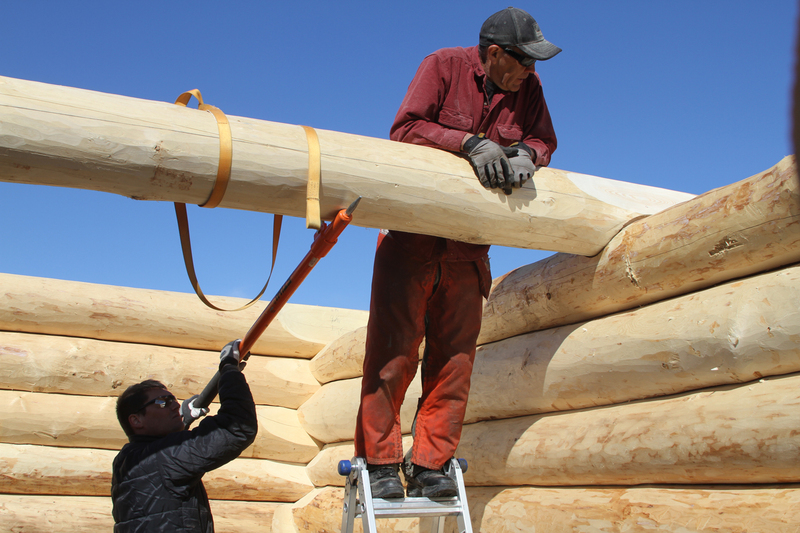 As homes are being built tighter in Alaska to save energy, less air is able to leak into or out of the building, so things like water vapor and chemicals generated from cooking or off-gassing furniture can be trapped inside. Without ventilation, they can build up to harmful levels for both humans and buildings. Some Alaska homeowners are wary of mechanical ventilation, such as fans or heat recovery ventilators (HRVs), because they use electricity and replace heated air with cooler air. As a result, some people turn off or disable their ventilation systems. The BrHEAThe system marries heating and ventilation so that incoming air is always hot and fresh. The HRV brings in fresh air and recovers most of the heat from outgoing stale air. The fresh air enters a filter box and then passes through a heat exchanger, absorbing heat from a coil connected to a boiler. “If we pump hot water through this heat exchanger, it’s going to warm the air that moves across the heat exchanger from 40 degrees to 140 degrees,” said CCHRC research engineer Bruno Grunau. The heated air is then distributed via ductwork throughout the home. The high efficiency boiler also heats a domestic hot water tank. During a test run in the lab, the system worked smoothly: 25-degree air from outside was raised to 58 degrees by the HRV, then further boosted to 139 degrees by the heat exchanger. The BrHEAThe system will be installed at a CCHRC research prototype home in Buckland that breaks ground this week. “As building envelopes are getting warmer, heat loads are being reduced. As a result, systems like this can now be used to meet heating needs,” Grunau said. Video of a test of the heating system. Posted in Uncategorized on April 18, 2013 by mrettig.